Sangria Brunch at The Boulders Resort - Yay Baby! 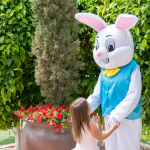 My idea of a perfect Sunday is brunch enjoyed outside on a sunny day with great food and good company; but The Boulders Resort & Spa has somehow managed to improve upon perfection by adding some Spanish flare to the mix. 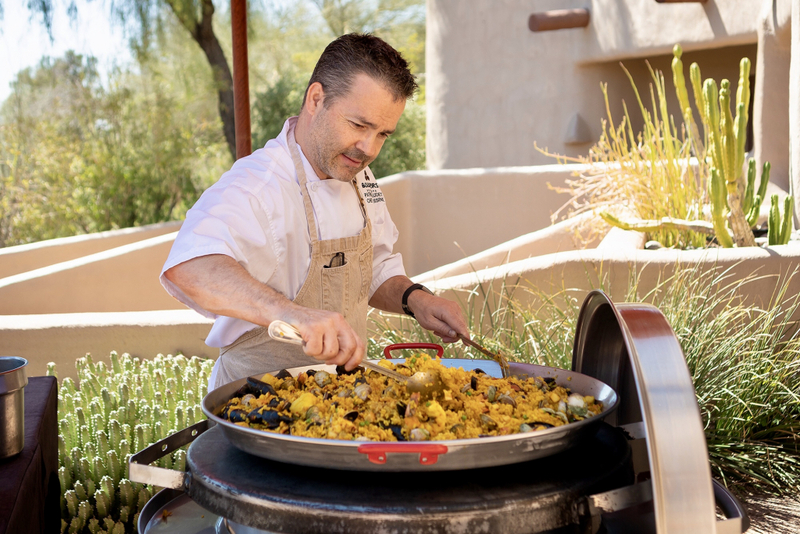 This spring, The Boulders is hosting a Sangria Brunch and it is well worth a visit – a fiesta nestled within the beautiful and unique scenery of the resort. 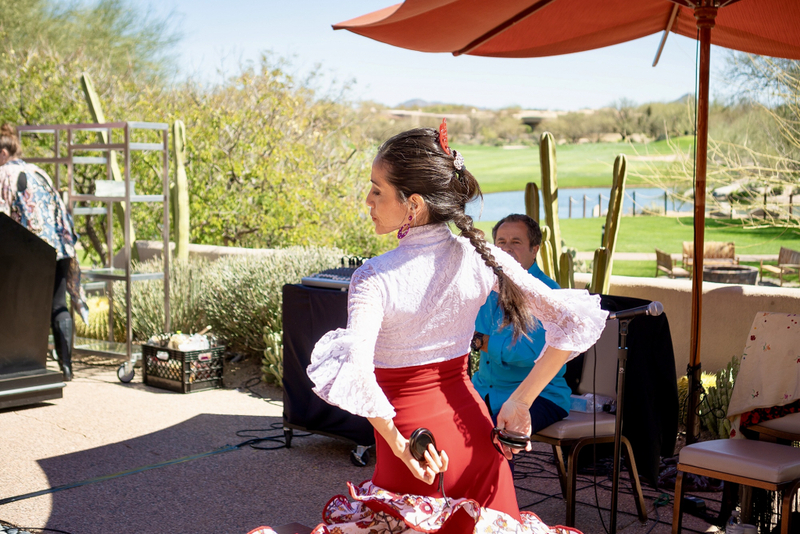 Think sangria, tasty food, live music and a captivating Flamenco dancer. 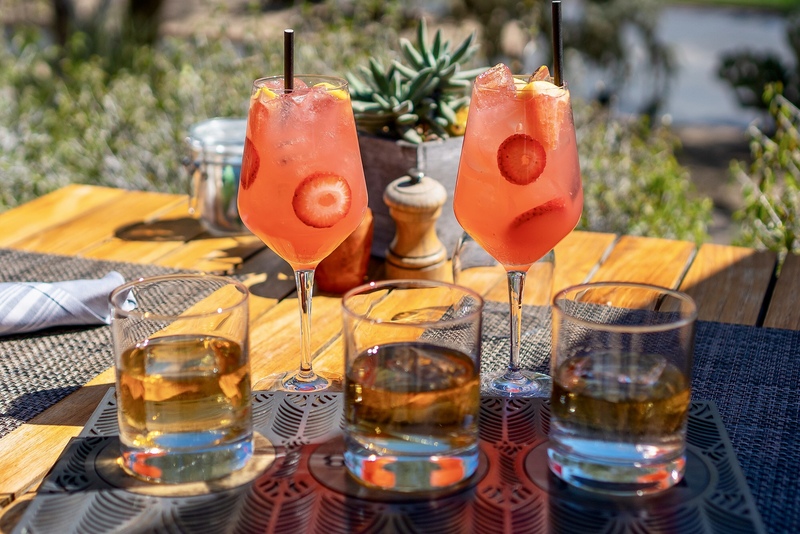 Any visit to The Boulders is awe-inspiring, set amongst imposing giant rock formations, in the lush desert landscape is breathtaking, but The Sangria Brunch is truly something special. 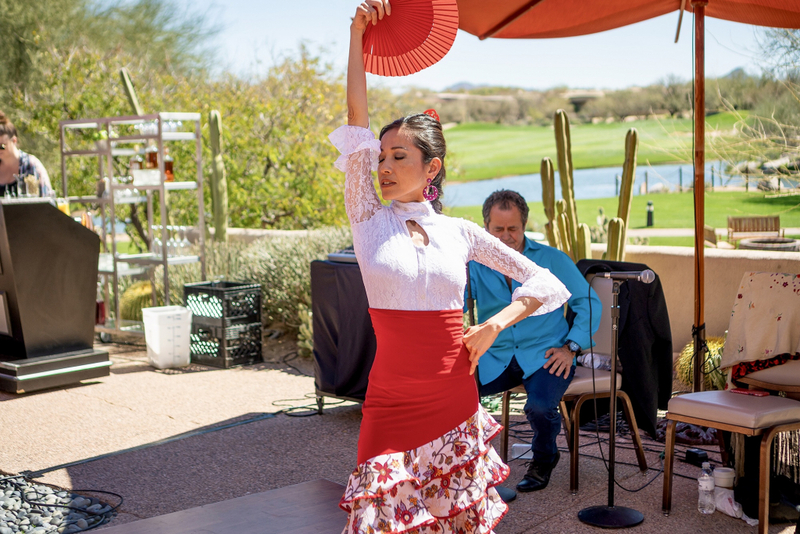 Upon arrival at the Palo Verde Patio, where the brunch is held, I was greeted by the upbeat sounds of music, drums, guitar and a Spanish serenade. The sun was bright, the breeze was light and I knew I was in for an experience only The Boulders can provide. Upon being seated we immediately ordered the Strawberry Riesling Sangria, a crisp blend of Chateau Set Michelle Riesling, Deep Edy Lemon & Grapefruit Vodka and fresh strawberries. It was perfectly sweet and refreshing and available by the glass or a pitcher. And because this is a Sangria Brunch you will also find a Sangria “Old Fashioned” made with red wine, Maker’s Mark, orange, vanilla and black cherries; and the Acai Rose Sangria with White Zinfandel, acai, raspberry and cranberry. 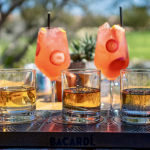 Keeping with the Latin flair, they offer an Aged Bacardi Rum Flight, beautifully presented with a tasting of Añejo Cuatro (aged 4 years), Reserva Ocho (aged 8 years), and Gran Reserva Diez (aged 10 years). 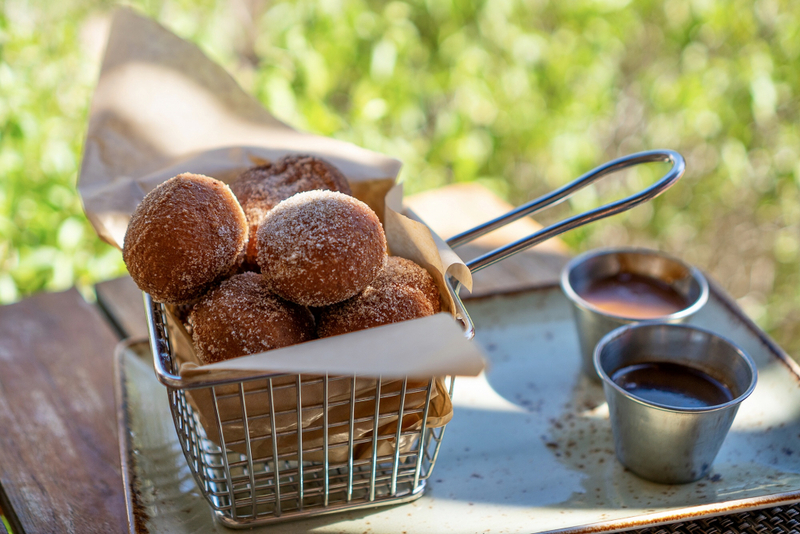 We started our leisurely brunch with an order of donut holes served with two dipping sauces; a rich chocolate uniquely spiced with a hint of chili, and a luxurious salted caramel so deliciously decadent I could eat it with a spoon, but no need because those warm, freshly made sugared donuts made for the perfect delivery from plates to lips. YUM! For our entree we enjoyed the featured, Traditional Valencia Paella. The chef has gone all out with this paella. It’s cooked outside on the large pan typical to the dish. 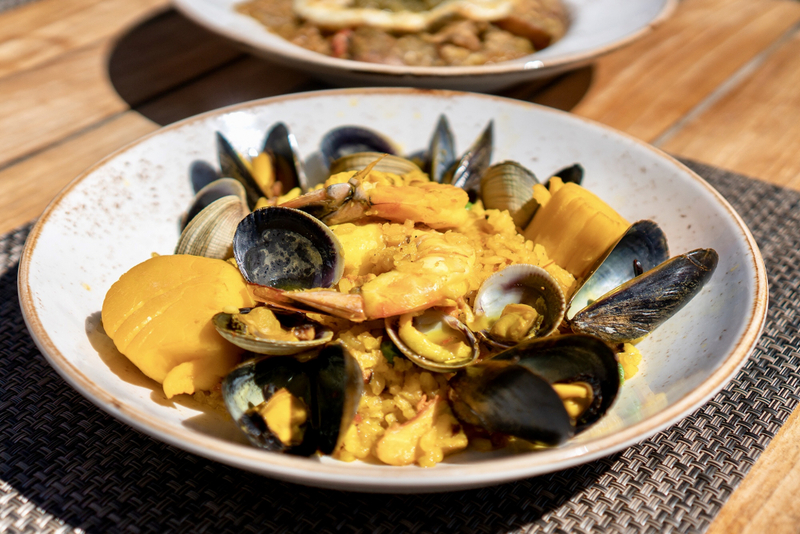 The amount of seafood is generous and cooked with Spanish chorizo, chicken, and saffron scented rice. 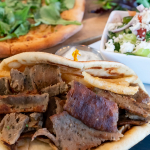 The chef scoops out a portion for every order, scraping the bottom for the caramelized bits that add a depth of flavor and texture. The dish is beautiful, loaded with the succulent seafood, tender clams and mussels, expertly cooked shrimp and sweet scallops. 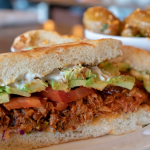 It’s absolutely fabulous, rich and comforting, and perfectly paired with that delightful sangria! While we sipped our sangria and enjoyed our paella we were wowed by the beauty, grace and talent of Yumi La Rosa. She tapped, stomped and clapped across the dance floor to the rhythm of the band. Her dancing was intoxicating (or maybe it was that 2nd glass of sangria). She did a mesmerizing fan dance, and brought out the castanets for an up-tempo jig. Ms. La Rosa brought so much excitement and fun to the atmosphere. All the diners clapped along, it was a true fiesta! 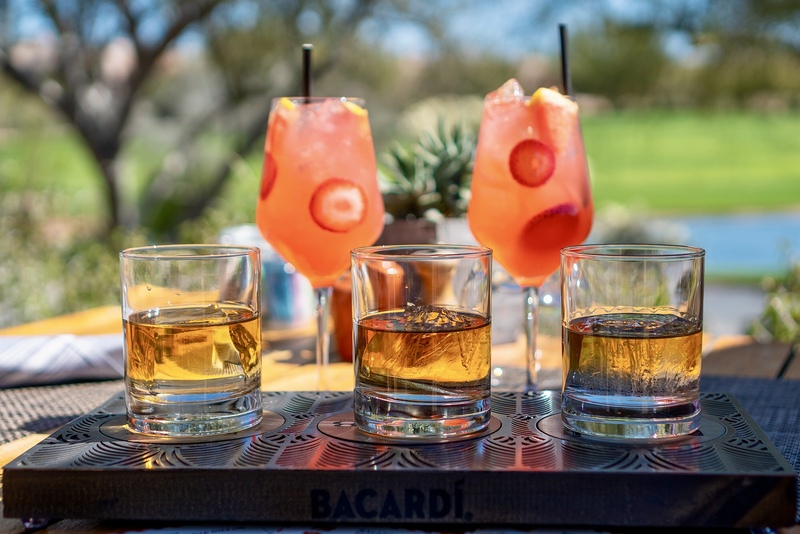 The Sangria Brunch at The Boulders Resort is the the perfect way to spend a leisurely Arizona Sunday morning. The food is great, the sangria divine and the entertainment is will having you shouting OLÉ! Disclaimer: I enjoyed the Sangria Brunch at The Boulders Resort free of charge in exchange for this review. All opinions are entirely my own.